Director of the U.S. Federal Bureau of Investigation, James Comey, testifies before the House Judiciary Committee at a hearing on October 22, 2015. 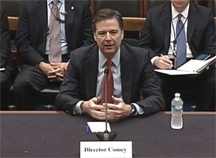 On July 7, 2016, Director Comey testified before the House Oversight and Government Reform Committee in the matter of Sen. Hillary Clinton's email practices. He explained in his testimony that he found no evidence of criminal wrongdoing, because of the absence of mens rea — literally "guilty mind." In other words, the investigation was unable to answer the question, "What were you thinking?" with evidence of criminality. Photo courtesy U.S. Federal Bureau of Investigation. If your job requires you to have the answers, a trap awaits: even though you might feel obliged to have all the answers, you actually don't. You might have most of the answers most of the time, but nobody has all the answers all the time. Eventually, someone will ask you something, and you'll begin to answer before you realize you're clueless. At that point, most people choose one of four options. Some, recognizing their own cluelessness, make up something they hope will satisfy the questioner. Others feel so obliged to answer that they suppress their feelings of cluelessness, and then respond with their best guess, concealing (or not realizing) that they're only guessing. A third group claims to know how to find the answer, even if they don't, and says something like, "I'll get back to you." The last and smallest group responds with some version of, "I don't know." To make the I-don't-know choice a little easier, here's a little collection of unanswerable questions. Even if asked about the present moment, this question is difficult enough, but reconstructing what you were thinking in the past is even more difficult. In a carefully facilitated retrospective, with safety assured, an honest answer is best. Otherwise, the question is likely rhetorical, and in public, you probably have to fall on your sword. Try not to let the sword nick any important body parts. Unless P is in the room with you, you don't actually know. The best you can offer is your latest information: "I saw him in the hall an hour ago;" or, "Clackamas, last I heard." What is/was person P thinking? If even P can't answer this question, nobody else can. One reasonable response: "I don't know, exactly, have you asked P?" Why did person P make decision D? People make decisions for all kinds of reasons, most of them non-rational. Unless there's documentation, you're speculating. One response: "Hmmm…I'd be speculating." Why didn't event E happen? When things happen, we can often trace causes. But when things don't happen, the reasons can be many, many indeed. One possible response: "Could be any number of reasons…I'm not sure." What happened when you were out of the room (on travel, off line, …)? you weren't presentoffer first-hand information on anything that happened when you weren't present. One possible response: "I'm not sure, have you asked the people who were there?" Why do we do things the way we do them? Usually, we do what we do because we think we're following a pattern set by our predecessors. But maybe not. Unless you've actually researched this particular topic, you're just guessing. Would you like to see your comments posted here? rbrenneaUnbAcoWMsdpxSner@ChacJmpRSTUbUlNbrpwqoCanyon.comSend me your comments by email, or by Web form. I offer email and telephone coaching at both corporate and individual rates. Contact Rick for details at rbrenVnZggFUpdPmPmJAQner@ChacKNJPwGBDEScorBiLoCanyon.com or (650) 787-6475, or toll-free in the continental US at (866) 378-5470.